Next up in our series of jersey concepts is one that’s a bit outside the box. During our podcast discussing team names we were thrown all sorts of different options. One in particular stuck out and we decided to make it a reality to see what every one thinks. 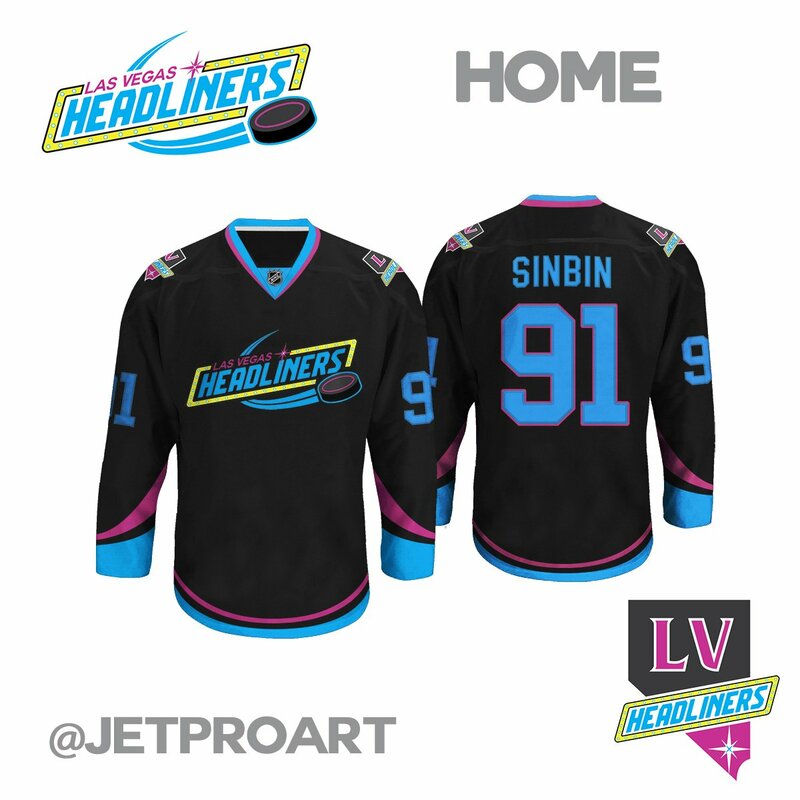 The team name is the Las Vegas Headliners. Here’s what Isaac’s magical photoshop came up with. The team would be more commonly referred to as the Liners. 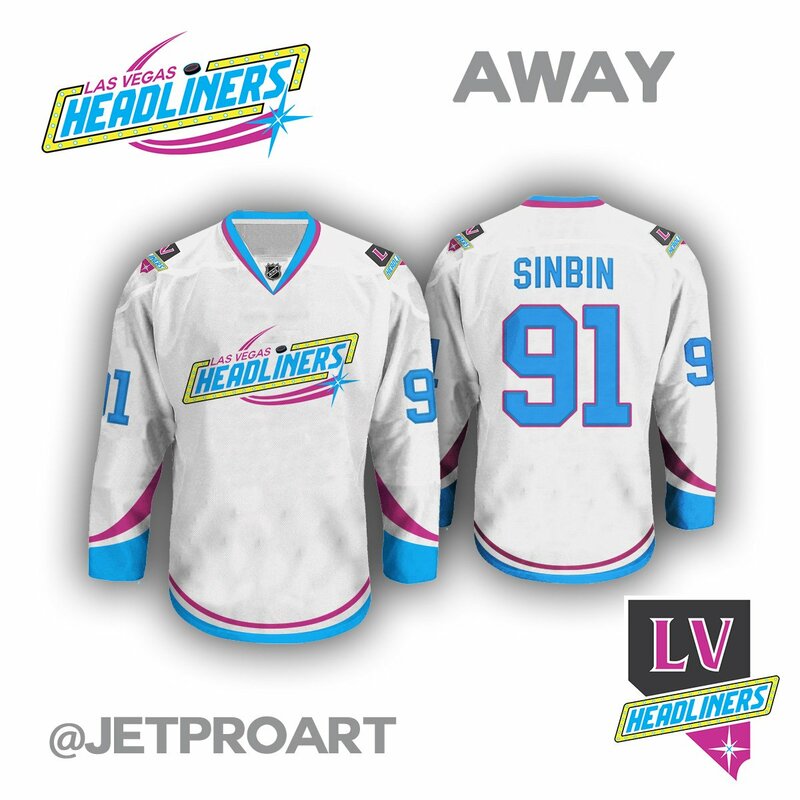 The main idea behind the jerseys was to give the team some of that club feel Las Vegas is known for. That’s why we added in the light blue, yellow, and highlighted the jerseys with a neon pink/purple. The hope would be that at least one of these colors would become synonymous with the city and the team and would become a fan favorite inside the arena. If you like them, Isaac deserves all the credit, if not, blame it on me (Ken) I’m the one who thought pink was a good idea. What is this the 80s?!?!? According to an interview I read from Foley related to team names… Some of the issues are related to domain names getting taken they wanted to use. The clear indication is regardless if they use the Knights name is the colors will be Grey, Black, and Gold. The Vegas Star I think they call it, where the sword points downward is my favorite for a chest crest. Its iconic thinking of it related to Vegas from signs that seem to use it. I am really upset by negative views or comments I saw in articles about Vegas. To me its a no brainer they should be the NHL expansion team… Others think they will fail or be moved after 5 years? They do well with Frozen Fury, I think their rivalry will be Anaheim Ducks with scumbags like Perry its hard not to :). Kings will have a connection with AEG so it will be beneficial to help them by having a stadium series game like they did Rangers at Caesar’s Palace :).